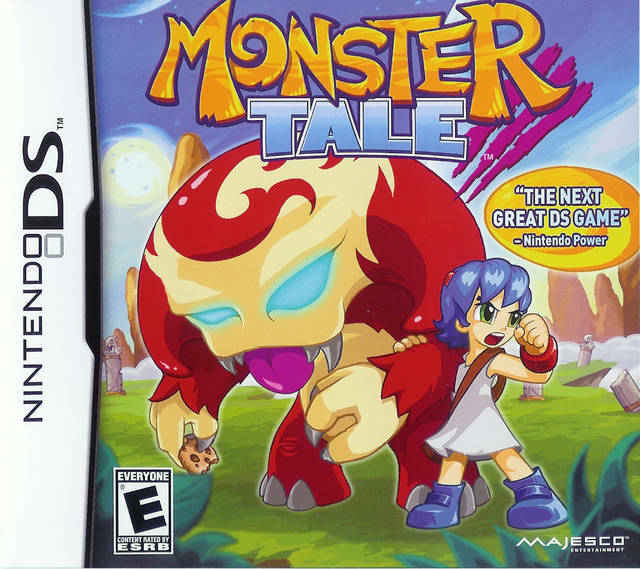 Monster Tale is an action-platformer for the Nintendo DS, featuring a pet monster, Chomp, who accompanies you everywhere and helps you fight, and whom you can level up and customise. You play as Ellie, a young girl who found a magic bracelet in a forest, which transported her to a magical kingdom ruled by children. Ellie soon found a huge egg, which hatched a cute little monster. The monster decided to follow Ellie, and together you explore and fight other monsters in an attempt to return home. Your pet, named Chomp, is the main feature of the game. In fact, I would say Chomp is the main point of the game. Although you control Ellie, you can direct Chomp to either fight at your side (in the top screen), or rest/train in the bottom screen. Ellie has a melee attack and a ranged attack; and abilities (including movement abilities like wall jump) and upgrades (e.g. more powerful shots) can be acquired or purchased throughout the game. These abilities of course help you fight and explore the world. On the other hand, Chomp is the only one who gains XP and level ups and has stats. Levelling up chomp not only makes it more powerful, opening up special abilities and attacks, but also opens up an evolutionary tree where Chomp can turn into different forms - either child, juvenile, or adult forms specialising in either fire, water, or wind element. Melee combat is relatively basic. Melee damage can be upgraded throughout the game, but I felt that most enemies take quite a few (maybe 6-10) hits to destroy - which can make it quite a slog to go through long passages. The ranged attack has many more upgrades and varieties, is more powerful, but consumes energy - which means you cannot solely rely on it for any encounters. Chomp, of course, can be used for any combat. It has its on-demand special attack, as well as normal attacks. However, I found that its normal attack is either not powerful enough (in its child form) or not frequency enough (in its adult form). Using special attack or being attacked also depletes Chomp of its health/energy, which means Chomp needs to rest in the bottom screen until it is fit again to fight. All-in-all I think that makes the normal enemy encounters not very fun - and the difficulty level can be uneven in places. However, the boss battles are very fun, all with their own gimmick. Coupled with the back story of each boss (all of them children accompanied by monster pets, magically transported to this magical kingdom before Ellie did), they are definitely the highlight of the game. Rather than actively encourage player to explore for the next place to go, Monster Tale always highlights in the mini-map where you need to go next. In fact, the place you need to go next almost always is on the other side of the map/level - regardless of whether you just picked up an ability (e.g. air blast) or just trigger an event (e.g. a gate opened after a boss encounter). For me personally, the long travelling and the limited branching path would be less annoying if normal enemies are more easily dispatched or avoided. On the other hand, it provides opportunities for grinding/levelling up Chomp. So, I think if one is really into training Chomp and making it the main focus of the combat and gameplay, it is not a problem at all. Monster Tale is a cute little game. Based on the art-style and mini-map design, I think it is aimed at the younger demographics. However, it features everything one expects from a Metroidvania game, and might be a good introduction to the genre for younger gamers.